Lemon Curd is so bright and flavorful. Perfect with berries, dolloped on cakes or layered into a lemon meringue pie. Nothing screams Spring, like a dessert made with fresh lemons! This version is sweetened with honey for a truly decadent and refreshing treat. 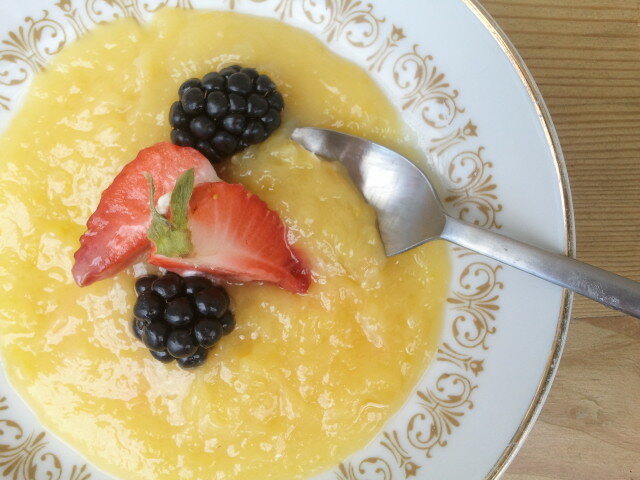 You will see this gluten free, grain free and sugar free lemon curd recipe used in many future recipes, including lemon meringue pie, lemon mousse, and cupcakes. Zest your lemons, set zest aside for later use. In a large heavy bottom stainless steel pot, slowly melt your butter. Juice your lemons in a large stainless steel bowl. Add juice to melted butter. In the same stainless steel bowl, whisk together your eggs and honey. Bring the butter and lemon juice mixture to a boil. Then temper your egg mixture slowly by adding a small amount of the hot liquid, whisking at the same time. Slowly mix in the rest of the hot mixture. Pour entire mixture back into pot. Add lemon zest. Bring to a boil, whisking frequently. Cook for an additional 4-5 minutes until it has thickened and is nice and shiny. Remove from heat and pour into a bowl. Cover with plastic wrap, directly on top of the lemon curd (to prevent a skin from forming). Refrigerate for up ot 1 week. *if you are afraid to cook over direct heat, you can cook the mixture over a double boiler of simmering water. However, it will take longer to thicken and cook. I do not like to strain the lemon curd after cooking because I actually like the texture of the pulp and zest in it. However if you would like a smoother finish, feel free to strain your lemon curd after cooking. I’ve made the lemon curd and its great. Now I am going to try this with limes and make a blackberry lime meringue pie! Elizabeth, that sounds like a wonderful combination! How did it turn out? How do you turn this into a lemon meringue pie? I usually get about 1/4 cup of lemon juice from each lemon. I hope this helps! thank you. I will give it a try! I love all of the recipes I have made so far. Thank you so much! I made this and subbed coconut oil instead of the butter and it turned out great. I used 1 cup of melted coconut oil. Just wanted to let you know in case others wanted a dairy free option. thank you. This turned out great. In fact every recipe i have used of yours i have loved. Thank you so much! hi i just made this, my first time ever attempting a lemon curd, it is delicious and once i got over my first time jitters it’s pretty easy to make too….i used 1 cup coconut oil instead of butter, boiled the lemon/oil mixture in a pot, transferred to the egg mixture in the metal bowl as per the instructions, then transferred the completed mixture to a double boiler to finish it off where i had the water simmering and ready to go….